Although I do enjoy going away on vacations for the holiday season, it's sometimes nice to stay home and relax. What's nice about being home for the holidays is the comfort of your own house. You can deck out your home in all the Christmas decorations and bake all the Christmas cookies to make your friends jealous. But sometimes, it can be a boring to be at home for the holidays. No one really like the "same-old thing," so don't let it be dull and uneventful! 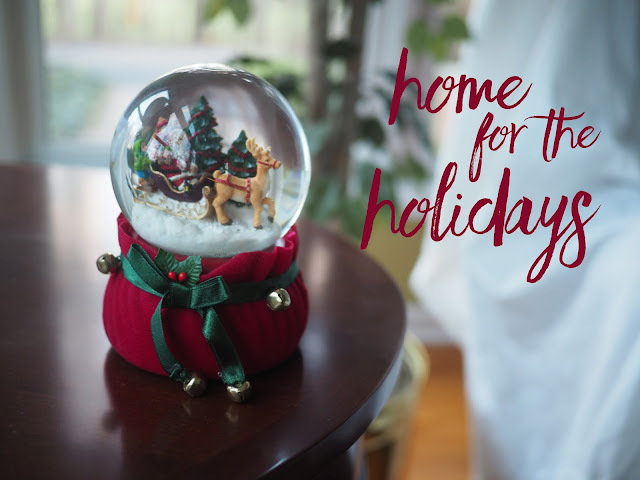 Here are some ideas for activities that you can do while you're home with the holidays to spread Christmas cheer and festivity. My friends always enjoy this, because it's fun to see what the house will look like. If you're feeling competitive, try buying two gingerbread houses and creating teams. Whoever has the best gingerbread house wins. You don't need to be in Times Square to go ice skating and get in the Christmas cheer! While they may always do it in movies there, you can still go to your local rink and pretend that you're more graceful than you actually are. Who scares if you fall, as long as you're having fun! Host an ugly Christmas sweater party. I don't know about you, but I love hosting parties. While there are so many great holiday themed parties that you can host, (Pinterest has you covered for all your party hosting needs), I've always liked the idea of an ugly Christmas sweater party. Ask your friends to come in their ugly Christmas sweaters and do all kinds of Christmas themed activities while drinking hot chocolate and munching on peppermint bark. Use this time to show off your freshly baked Christmas cookies and your art museum worthy gingerbread house. Every town, even the smallest ones, are likely to have some kinds of events for the holiday season. Tree lightings are pretty common, but there are also other events that you can find if you look into it. The other day, I attended a Christmas themed event, where there were carolers and hot chocolate and lights as well as other activities, and I hadn't even known that this event existed until recently! You'll never know what you might find. Do some research and see what's happening in your area. Channel your inner Anna Bond and try your hand at making your own Christmas cards. I do this all the time, not just for Christmas, but for birthdays or any other special occasion. It's a good excuse to break out the art supplies and creativity and always adds a little extra glam to your gift. It's not only a fun activity, but your friends and family will love seeing the cards that you made. Have a Christmas movie marathon. Pull out the classics! There are so many great Christmas movies out there. You can gather your friends or just camp out under a mountain of blankets by yourself and enjoy a movie. Bonus points for being extra Christmassy, have a fire going in the fireplace and drink hot chocolate. There are so many opportunities to give back to the community during this time of year. You can give away old clothes to people that need them, donate food, or get Christmas gifts for the children of families that can't afford them. I mentioned on a previous Best of the Internet post, that there are some great ideas for giving back during the holiday season in this post on LaurenConrad.com. Are you planning on going anywhere or will you be home for the holidays? Same! It's just so addicting!